You must be logged in to leave feedback. To make a new customer account, click on "My Account" in the upper right-hand corner, and go to "Create Customer Account". Please read and agree that you understand this is a pre-sale item! Golden State Mint's Buffalo 1/2 ounce Copper Bullion Rounds are brand new, non-circulated copper rounds with a rendition of James Earle Fraser's classic design of the Buffalo Nickel issued in 1913. Fraser's Indian Head nickel design is regarded as among the best designs of any U.S. coins. The obverse (front) of the round depicts a Native American and with the motto ”LIBERTY” on top right. The reverse (back) of the rounds depicts a standing American bison (buffalo) atop a mound of dirt with the device “Golden State Mint” on the top. The rounds are hallmark stamped with their weight and purity and have a reeded edge. These rounds are an excellent way to buy copper, and are easily stacked and stored making them perfect for investors and collectors alike. These privately minted rounds or medallions were made in the USA by Golden State Mint. Investors are able to purchase directly from GSM, rather than buying sovereign minted coins which carry a much higher premium as they are sold between middle-men before they're available for retail purchase. Get more for your investment dollar, and purchase rounds or medallions directly from Golden State Mint! 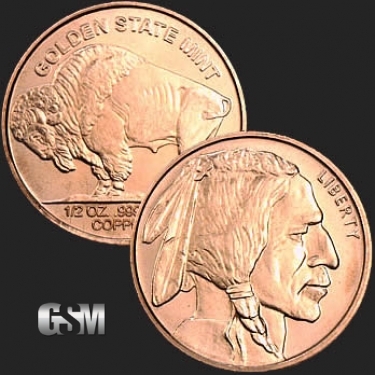 If you liked this product, you should check out our 1 oz Copper Buffalo, 5 oz Copper Buffalo , and 1 oz Silver Buffalo. Shipping: Free on orders over $500! To make a new customer account, please click here. Subscribe to our newsletter for New Product Alerts, Exclusive Discounts & News.